This is my first David Baldacci novel and you may wonder why start in the middle of the series. This book came on my radar when a co-worker informed me I needed to read this book and loaned me a copy. Despite it being the fourth book in the series it can be read as a standalone. The author provides sufficient background information making it easy for readers to follow. Now that I have gotten a taste of this series, I intend to pick up the other books, as I am keen to get more information on the members of the Camel Club. John Carr aka Oliver Stone is the most wanted man in the United States. He has been on the run for thirty years, but he stepped up a notch on the most wanted list when he assassinated a senator and the CIA director. I do not condone murder, but I understood why he felt he had to eliminate them. This recent action may just be the death of him literally, but he was not giving up without a fight. His journey while on the run led him to a coal-mining town named Divine. He had no plans to stay, but suspicious occurrences prompted him to remain and investigate. However, doing so places him in a dangerous situation, which may just be the catalyst to end his life. Meanwhile, a member of the CIA who wants him dead has sent their best agent to find and capture him alive at all cost. Divine Justice provided me with a thrilling ride rife with suspense, mystery and danger. The story pulled me in from the beginning and I had a hard time putting the book down. I turned the pages in anticipation of what Oliver’s investigation would uncover. I also needed to know if the CIA agent hunting Oliver would catch up with him and if he did how the events would play out. Even though I enjoyed rush I received from this story, there were a few inconsistences. Events occurred, but it was not clear how the story reached this point as it lacked details. The author failed to follow up on these occurrences leaving me with questions even after the story concluded. I found aspects of the story predictable but it did not diminish my enjoyment. There was a hint of romance, but as this was a fast-paced thriller, it took a back seat. However, I hoped that after the events surrounding the investigation and the CIA’s hunt for Oliver were over the author would indicate what transpired after the telephone call. The story featured a diverse range of characters. Oliver fascinated me. He is almost sixty years old and is a fighting machine. He found himself in many impossible situations, but somehow he always finds a way out. His commitment to justice is his defining trait. He never allowed his need to remain under the radar prevent him from helping someone in need. I loved that his friends had his back, despite him telling them to leave well alone. They pulled all the stops to help protect him from being caught in the CIA’s net. 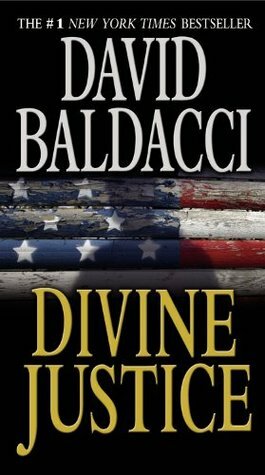 Divine Justice was an engaging thriller and one I would recommend to fans of the genre.